Hi, I’m Sam Leonard, and I’m going into my second year of A-levels. I’m at Embecosm for a week as a work experience student, working on producing an exploit as a proof of concept for the Stack Erase feature that Embecosm have implemented in GCC as part of the Innovate UK-funded SECURE project. I’m interested in all of aspects of Cyber Security, but in particular I enjoy Binary Exploitation. Stack Erase is implemented in GCC for RISC-V and x86, and can be used to protect secrets stored in a function’s stack frame by erasing the stack after function return. 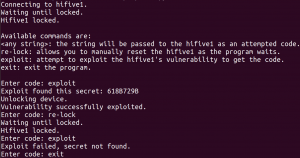 In this blog post, we see how the feature can be used to prevent a secret from leaking from a device, even when a buffer overflow attack is successfully executed against it. When the program first starts, it waits for a button (connected to pin 6) to be pressed. When the button is pressed, a secret value is generated and displayed on the LCD screen attached to the board (e.g. 0x2BE354FB in the photo above). if the user supplies the correct code, the state changes to “unlocked” (see photo below). if an incorrect code is supplied, the message “Incorrect code…” is sent, and the user can try again. 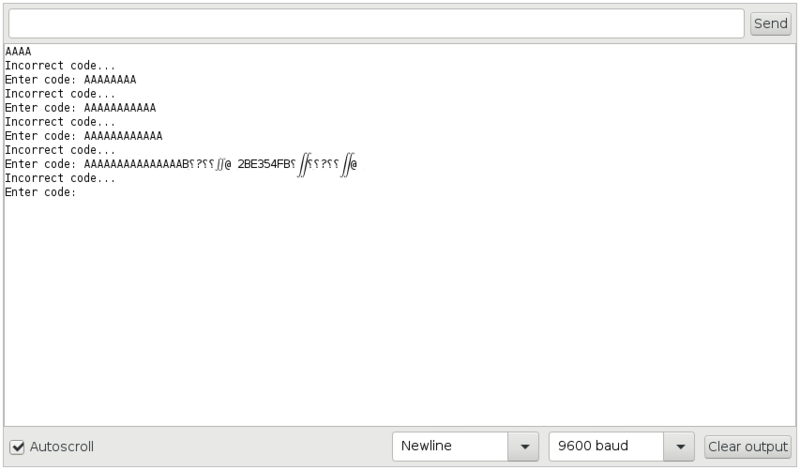 The readSerialBuf function (shown below), which handles user input, has a vulnerability – it reads characters into the buffer buf until it encounters a newline, but only has 8 bytes allocated for user input. Any user input beyond 8 bytes overwrites other values on the stack. That the user can overwrite memory after the buffer. In the first run, the board flashed with the normal implementation of the Lockbox application. In the second run, the board is flashed with an implementation that uses Stack Erase to protect the secret, which is described in the next section. The secret is leaked from the stack frame of the Print::printNumber function. To protect the secret, we can edit the source and header file to add the stack erase attribute. char buf[8 * sizeof(long) + 1]; // Assumes 8-bit chars plus zero byte. After recompilation and flashing to the board, the code executes in a similar manner to before. However, when the exploit is run, the characters of the secret have been overwritten with null bytes (during the epilogue of the printNumber function) so the secret is not leaked. Stack Erase is an effective way of preventing accidental data leakage and provides a tool to improve the security of applications, alongside other measures such as ASLR, control flow integrity, stack canaries, executable space protection, amongst many others. Stack Erase is especially useful when other measures have failed, as you can’t read a value that’s no longer there. Patches to add Stack Erase to upstream GCC will be submitted shortly.